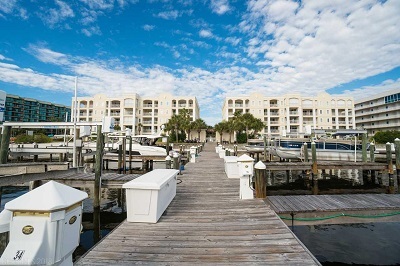 Orange Beach condo for sale at Perdido Grande. One of the most sought after second home complexes on the Alabama Gulf Coast. Perdido Grande features an expansive footprint with plenty of room to spread out. With live oaks at the gated entrance and green space galore. This high end boaters paradise lacks nothing with pools in and out, private marina overlooking terry cove, and low density at home feel. This unit has plenty of sq footage to spread out and open floor plan for entertaining. The balcony overlooks terry cove and is the first unit back offering great views of the islands. This unit is offered with boat slip #51 .